Kids don't always like to eat their vegetables and it's an age-old battle that parents have a hard time winning. If kids help grow their own gardens, though, it is more likely they will eat their vegetables, even the fussiest eaters. 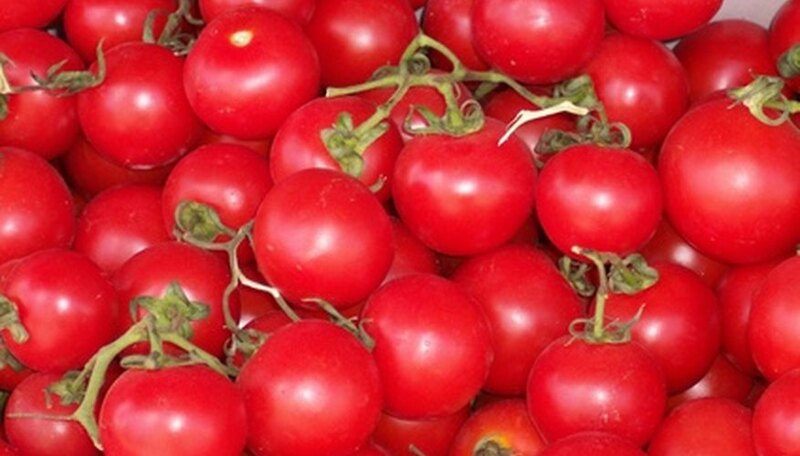 Tomatoes are a good vegetable to grow for kids, especially cherry or grape tomatoes, since they are sweet and the small shape makes them fun for kids to eat. Choose different-colored tomatoes for more interest and grow either in containers or a garden area. Select an area for growing your tomatoes that receives full sun all day. Begin preparing the site in early spring or as soon as there is no chance of frost. Loosen the ground with a rake or shovel. Remove any rocks and large clods of dirt. Add a bucketful of compost and work in well to create a light, fluffy soil that is well-draining. Dig a hole for each plant that is about twice as deep as the height and width of the root ball of the tomato plants. Space the holes 12 inches apart and rows 18 inches apart. Place a handful of bone meal into each hole. Remove all but the top set of leaves from the tomato plants. Place a tomato plant into each hole so the top set of leaves is right above ground level. Planting tomato plants deeply allows the roots to grow stronger, making for a sturdier plant. Fill in the holes with dirt and tamp down gently around the plants. Feed the tomato plants with a balanced, water-soluble fertilizer after planting and water in well. Apply fertilizer every two weeks until fruiting begins, then stop fertilizing for the season. Add a layer of mulch around the plants to help retain moisture in the soil and keep weeds under control. Use shredded bark, chopped leaves or compost. Place a wooden stake about 6 inches away from the plant and tie the tomato to the stake using twine or pieces of nylon. As the plant grows, retie as necessary. Tomato cages can be used instead of stakes. Plant tomatoes in a container if desired. Harvest tomatoes when they are fully colored with no green on them. Do not water tomato plants overhead with a sprinkler to avoid getting the foliage wet.